Formerly, there were a whole raft of words and phrases which actually meant something (e.g. racist, fascist, bigot, progressive, environmentalist, etc.) of value. Through overuse and misuse these words and phrases now mean precisely nothing. Cough in the wrong direction, fascist! Scratch yourself the wrong way, bigot! You get the picture. There is no reason why anyone using limited liability anywhere should be afforded anonymity: the very idea is an abuse of human rights. Yup, this is how meaningful and truly descriptive words and phrases lose their value. Forget about Christmas, this is the one true time of the year which brings all humanity together .... Eurovision finals. And they will surely name the conference and campaign after another city. One wonders when the windbags will run out, and resort to naming treaties, "declarations", and "processes" after forests, intersections, and railroad yards? John Rosenthal points out that, offhand, it is "rather odd" that Obama — that would be the man who, if any, has nothing but a caricatured, shallow, and oversimplified knowledge of history — "would be planning a trip to Germany in connection with ceremonies marking" marking the 65th anniversary of the Allied invasion of Normandy. But when one considers just where exactly in Germany Obama is headed, then the significance of the visit becomes more clear. There is some talk of Obama visiting the Buchenwald concentration camp outside Weimar, in whose liberation Obama’s great uncle Charlie Payne is famously supposed to have taken part. But the Buchenwald visit appears not to be the main event and indeed it can be presumed to have been included in discussions as something of an alibi. The symbolic significance of a visit to Dresden by the American president — especially one undertaken in connection with a D-Day commemoration in France — may be missed by some Americans, but it is absolutely unmistakable for the German public. For Germans, Dresden is the symbol bar none of German suffering at the hands of the Allies. … The bombing of Dresden is commonly described as a “war crime” in German discussions. Alleged crimes committed by the Allies against Germans and Germany have indeed become a sort of German literary obsession in recent years, with numerous books being devoted to the subject. … The rhetoric employed by [Jörg Friedrich] went so far as to suggest an equivalence between the Allied bombing of German cities and the genocidal conduct of Nazi Germany itself. As a result of the passions provoked or released by Friedrich’s book, the expression “Bombing-Holocaust” has passed into the German lexicon. Although especially favored by so-called “extreme right” circles (i.e., more-or-less openly neo-Nazi ones), the term merely expresses what is implicit in ostensibly more mainstream discourse. It is virtually unthinkable that Obama could give a speech in Dresden and not allude to the bombing of the city. … Moreover, for Obama to visit both Dresden and Buchenwald would suggest precisely the sort of outrageous parallels that have become commonplace in Germany at least since the publication of Friedrich’s The Fire. …As bizarre as it may seem, President Obama’s impending trip to Dresden suggests that German revisionists [of “Roosevelt’s war”] have a friend in the White House. Post-facto critics never tell us what they would have done instead — lay off the German cities and send more ground troops into a pristine Third Reich; don’t bomb, but invade, an untouched Japan in 1946; keep out of WWII entirely; or in its aftermath invade the Soviet Union? goes WND's joke of the day. The biker jumps off his bike, runs to the cage and hits the lion square on the nose with a powerful punch. Whimpering from the pain the lion jumps back, letting go of the girl, and the biker brings her to her terrified parents, who thank him endlessly. A New York Times reporter has watched the whole event. The reporter says, "Sir, this was the most gallant and brave thing I saw a man do in my whole life." The biker replies, "Why, it was nothing, really, the lion was behind bars. I just saw this little kid in danger, and acted as I felt right." The reporter says, "Well, I'm a journalist from the New York Times, and tomorrow's paper will have this story on the front page... so, what do you do for a living and what political affiliation do you have?" Not only do they enjoy that old favorite, parroting meaningless statistics on passport holders, but they’re so well travelled. Is it an “unregulated tax refuge”? A Masada for Europe’s free thinkers? The EU’s Lesotho-like Potemkin nation? Hell no, it’s Switzerland! Entitled to control their borders?!? How DARE they! You got that, right? The EU controls the conditions of immigration and residency in another nation state which isn’t a dependency. No wonder these clowns will always give the platform over to anyone who thinks the “Wesfalian notion” of the right of sovereign nations to govern themselves is somehow “dated”. They’re quietly in love with dictatorship, and see no problem with government coming from anyone BUT the people who are ruled by it. It’s almost to easy to say that it went from their history to something in the water. Currently there are no restrictions on the number of EU workers that can take up job positions in Switzerland. Never mind that the EU is dictating the terms of another nation’s sovereignty, they have America to wag their finger at. As for the Swiss, isn’t it time they turned their balls back in at the desk?. Frédéric Bastiat’s 19th century ”What is Free Trade?” offers a refreshing look back on the origins of natural economic thought, and provided is with a benchmark to understand where a society can stray away from it. We may here perceive that Nature, with more wisdom and foresight than the narrow and rigid system of the protectionists can suppose, does not permit the concentration of labor, and the monopoly of advantages, from which they draw their arguments as from an absolute and irremediable fact. It has, by means as simple as they are infallible, provided for dispersion, diffusion, mutual dependence, and simultaneous progress; all of which, your restrictive laws paralyze as much as is in their power, by their tendency towards the isolation of nations. By this means they render much more decided the differences existing in the conditions of production; they check the self-levelling power of industry, prevent fusion of interests, neutralize the counterpoise, and fence in each nation within its own peculiar advantages and disadvantages. The lessons offered by Bastiat are as timely as ever, just as the populist arguments trying to tug humanity away from the things that functionally make a free society free, we find the emotionalism of those notions have not changed. This is much like as we saw it recently on these pages when we spied into the sad acceptance of the oppressive subjugation of man to central authority that Edward Bellamy proposed as “progress” in the 19th century. Then, as now, the emotionalized and buffoonish inversions of the nature of the way people behave in their self-interest is the tool of those who want to dictate upon others the terms upon which they want you to live for THEIR purposes. Then as now they do this without respect to the judgment of the individual or a trust of people in any substantive way. Bastiat’s dialog clearly indicates that the argument against those things that lets free societies BE free have not changed or advanced in complexity, they just managed to produce more mass graves, almost all of them on the European continent where an obscene degree of central authority has always been employed, even when there is little reason to. What’s strikingly similar in those who oppose free trade imagine is that they seem to imagine that the world is static, and that all history has ended at the moment of their birth. The dynamism of a diverse world where you can’t necessarily anticipate every thought people have, or more to the point – to realize that they need not be fearful of it – are lost on them. It’s just too complex when charlatans offer the argument that there is some way to get something for nothing by way of the use of government’s power. Claude Frédéric Bastiat lives, as does this accessible translated adaptation of his work. The near-term outlook for solar concentrating systems at solar power plants in the Southwest is strong, Fine said. But prices for solar panels, typically fitted onto rooftops, are falling across the industry. Subsidies in Germany and Spain--the two largest solar marketplaces--are being scaled back and there is now more silicon available to make solar cells. Both factors are contributing to less business for solar manufacturers and lower prices. Added bonus is a lesson in market dynamics. Is the day the Soviet blockade of Berlin ended. For a moment. They could breath. For that day, they could feel that their island of freedom in a sea of oppression coercing them though hunger was secure. Poland may postpone by at least a year its plans to adopt the euro in 2012, amid signs of a worsening economy and budget deficit, the country's finance minister has told the Financial Times. "The first of January 2012 is still realistic, but it may require some delay," Jacek Rostowski said. "The world crisis has come along and it would be naive to pretend it has had no effect ... If we move it by one year that's not the end of the world." The criteria for joining the euro call for a deficit of no more than 3 per cent, which would make joining the euro by 2012 unrealistic. In order to meet that date, Poland would have to join the pre-euro ERM-2 trading mechanism this year, which Krzysztof Rybinski, an economist with Ernst & Young, said is unlikely. Given the colourful history of current euro countries in "adhering" to the 3 percent deficit rule laid out in the Growth and Stability Pact, we can readily dismiss that as a reason for the Poles not being "ready" in 2012. However, joining ERM-2 and having to begin the process of surrendering Polish monetary policy, now we get much closer to the real reason for the Poles wavering. Gee – lot’s of that “IsraHeil” stuff that make morons think they’re witty and insightful. What’s funny about it is that this pedantry not only hasn’t changed in decades, it hasn’t evolved. It’s a plane of thought that’s standing perfectly still, just like when Koko the chimp vocabulary stopped to grow. However to the sputum that spew it, it's regarded as brilliant, groundbreaking stuff, "ripped from today's headlines". Looking for a purely legal tax haven? Hazel Blears is facing fresh questions over the tax arrangements surrounding the sale of a flat in South London she had designated as a "second home". Miss Blears sold the property in Kennington, south London, in August 2004 for £200,000, making a profit of £45,000. She admitted last night that she did not pay capital gains tax (CGT) on the profit from the sale because "no liability" had arisen. 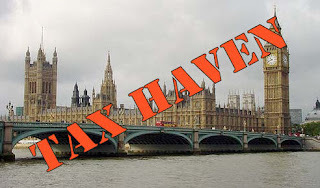 Easy to put the screws to Liechtenstein, Andorra, Cayman, Ireland, et al, when you have your own nice little tax haven evasion scheme up and running ..... even better when you get to write the rules and all is backed by the tax-payer, in the truest sense of the meaning. At this point, continued silence = approval from the hypocrite brigade. These statist shills have a true case of actual tax evasion pounding at the door yet refuse to bite the hand that feeds them, shocker.